Success in developing high-performance, multifunctional reverse osmosis membrane obtained by carbon nanotube-polyamide nanocomposite, which has paved the way for an innovative desalination system that will contribute to sustainability on a global scale. Model of MWCNT-PA nanocomposite microstructure, showing the proposed ordered PA regions in yellow around MWCNT fillers. The 21st century has been called the “water century”. Thus, desalting has become a vital form of engineering that influentially sways the efforts for sustainability in the face of water sources drying up across the globe. In recent times, the surge in development of technologies for wide-ranging desalination, such as dealing with environmental problems and treatment of water accompanying resource-producing as well as the purification of industrial water and municipal effluent (both problems common to all countries), has become one of three most important issues in terms of human sustainability. Therefore, expectations are mounting for a new water separation membrane that possesses both high performance and robustness beyond that of the technology for well-contrived percolation membranes of today (namely, the technology for existing desalination membranes). This expectation is driving international-level R&D forward to achieve such an innovation. At our Shinshu University Global Aqua Innovation Center, we are using our accumulated research knowledge in the field of nanocarbon as the springboard to launch from in pursuit of our goal to contribute to the development of the Japanese water plant industry and global-scale sustainability by developing basic science and technologies to achieve a high-performance, robust carbon based water separation membrane. Here, we are glad to say that as part of the expectation held in the core competence of our R&D center the results for newly creating a carbon based water separation membrane have been published in the British online version of Nature: “Scientific Reports”*. These results were achieved through the co-creative work of the project members cored around people in Shinshu University, and are consistent with project research conducted by the Global Aqua Innovation Center for improving living standards and water-sustainability”**, which is a Center Of Innovation (COI) program. From here on, we plan to use these R&D results as cornerstones to link up industry and academia to further technological deliberations, develop practical technologies and promote the project with the aim of implementing our innovations in society. Using a multi-walled carbon nanotube (MWCNT) with noncovalently weak surface modification (reforming) and an aromatic polyamide (PA), we employed our own unique method to prepare a nanocomposite membrane with a thickness of approximately 100nm, and then used interfacial polymerization to generate a reverse osmosis (RO) membrane. 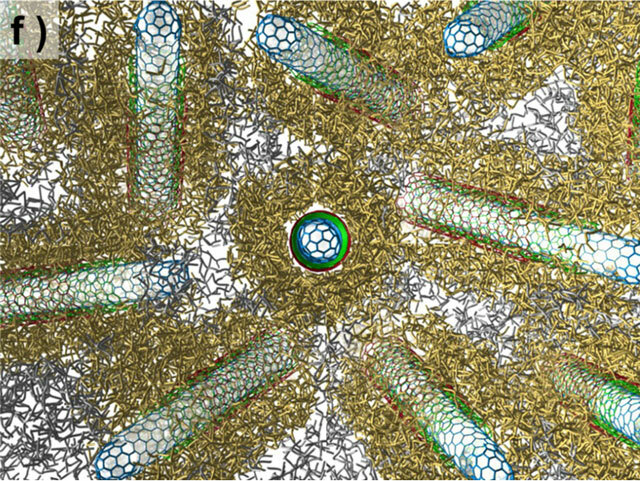 The active layer of the RO membrane is configured from a compound of well dispersed carbon nanotube (CNT), 15.5 Wt. %, and matrix polyamide. With conventional composites such as CNT and elastomer resin (nanocomposite), it was difficult to achieve uniform dispersion of CNT, which meant that CNT characteristics did not fully manifest themselves. Likewise, even in the RO membrane field, when the RO membrane was combined with CNT, once again uniform dispersion was difficult to achieve, which meant that CNT characteristics did not fully manifest themselves. By the way, we in the Shinshu University group developed our own unique method of CNT entanglement, and have had success in various fields with this method. In this research, we in the Shinshu University group combined our CNT entanglement technology with conventional thin-film formation technology to develop a new nanocomposite film formation technology. And, using this technology, we succeeded in developing an RO membrane with a polyamide composite membrane made up of highly concentrated and entangled MWCNT. The development of MWCNT-PA nanocomposite membrane has not only improved water permeability it also has superb properties that make it contamination resistant and chlorine resistant, as shown below. Features of our developed MWCNT-PA nanocomposite membrane include an aromatic PA layer with an unusual microstructure (with good water permeability and desalting properties) in the vicinity of the filler’s nanotube surface (see model diagram for details), and the contribution made by that nanostructure to the function of the RO membrane is obvious. Also, the addition of the MWCNT to the PA layer provides another benefit in that absorption control of iron contained in treatment water is achieved ? namely, the MWCNT addition is clearly beneficial in preventing a fouling of the RO membrane. Further, another point that should be raised is how this nanocomposite membrane functions to markedly improve resistance to chlorinated water. All of these features give the developed nanocomposite membrane superb permeability as well as an excellent desalting property to remove salt from saltwater. In addition, the two-pronged performance of antifouling and chlorine resistance shows that the functions of the RO membrane excel in comparison to CNT-PA nanocomposite membranes that have been reported on frequently up to now. Our unique in-house preparation of the composite membrane (the practical application of CNT entanglement technology) has contributed to the realization of these functions. And, images from a transmission electron microscope (TEM) provide further evidence that the unique PA nanostructure formed in the vicinity of the CNT contributes to the excellent permeability and excellent desalting property of the RO membrane. Indeed, as our developed RO membrane (using a MWCNT-PA nanocomposite membrane) incorporates a commercially available CNT, hopes are high that this novel membrane will be the practical answer to issues confronted by us all in the “water century”. This is an open recruitment type R&D program operated by the Japan Science and Technology Agency (JST). Here, the premise is based on the vision to anticipate the structure and lifestyle of society that should be aimed for considering the needs of future society that are dormant at present ? however, as this requires groundbreaking innovation that companies alone cannot hope to achieve, the initiative has been taken to tackle R&D via an industry-academia collaboration. Shinshu University is the core institution of the “Aqua Innovation Center for Improving Living Standards and Water-sustainability” within Vision 3 Establish a sustainable society with vitality (visionaly leader: Masaharu Sumikawa, Hitachi, Ltd., Executive Adviser). Hitachi Infrastructure Systems Company, Toray Industries, Inc. and Showa Denko K.K.